New Orleans Commercial Real Estate is a diversified market with seven different sectors, each sector is different in size. The table below shows the major sectors of the New Orleans commercial real estate market, as well as the average asking prices and actual transaction price variance, and the number of days the property was on the market. Currently there is 4.1 million square feet of New Orleans commercial real estate for sale and 3.9 million square feet of New Orleans commercial real estate for lease. Of the space for lease, the office sector comprises 2.4 million square feet, with 1.8 million square feet for lease and 600,000 square feet for sale. The average asking lease rate is $16.35 per square foot but the actual lease rate is around $14 per square foot and has been on the market 590 days. Since 2006, the office lease rates have increased steadily in New Orleans from $15 per square foot, with a few hiccups in 2008 and 2011. 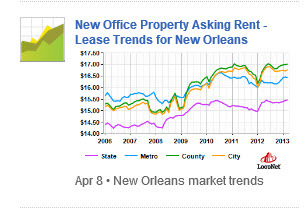 The New Orleans office lease rate has been 7% higher than the average lease rate in the state.